He has published widely in both peer reviewed papers and in text book chapters in the field of functional urology, where his research interests and clinical practice lies. He has published over 125 peer review papers and 10 book chapters. 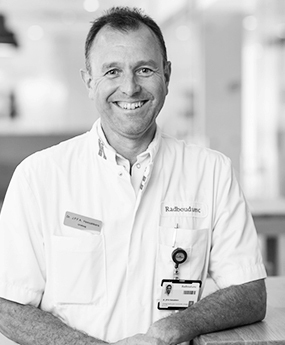 Dr Heesakkers continues to have an active role in research in functional urology within the department, and supervises trainees, research fellows, graduate students and post-docs. In addition he has an active role teaching both undergraduates and post graduates. He regularly gives invited lectures both nationally and internationally and is on the editorial board of several international journals in urology (Journal of Urology, Neurourology & Urodynamics, International Urology, Archives Espanoles de Urologia, Advances in Urology, Uroscope). He previously served as a member of the ICS clinical trials committee and educational committee and currently serves as a faculty member of the European School of Urology, the European Live Surgery Committee and Scientific Congress Office of the EAU. He is a member of the International Continence Society (ICS), European Association of Urology (EAU) and corresponding member of the American Urology Association (AUA) and an also member of the Continence Foundation of the Netherlands.